Besides your standard beach activities like sandcastle building, soaking up the sun, and playing in the ocean, weâ€™ve compiled a list of the Top 10 Things To Do on Hatteras Island. Â To ensure you have the best vacation possible and make the most of your Hatteras stayÂ while visiting our beaches, Â enjoy this vacation inspiration to help plan your trip! Want to check the view of our island from up above? Climb the Cape Hatteras LighthouseÂ for the best views of the Outer Banks. Â You can go at your own pace, and when you reach your destination, you’ll see gorgeous views of both the ocean and the sound at the top of the tallest brick lighthouse in the United States. *Travel Tip- If you don’t want to climb, its still a great attraction to look at in awe, and has beautiful ground to walk around and get pictures from different angles. “The Wreck” is the cutest little tiki bar inside the Hatteras Landing Marina that offers more thanÂ 75 different craft and domestic beers on tap! Â Enjoy the sound views while you watch the day’s catch come in and unload on the docks. *Travel Tip– Visit starting around 4 to watch the charter boats come in. Keep your eye out for various flags raised on each boat, it may give you a clue what was caught that day. Located in Frisco,Â this is an experience you don’t want to miss. Equine Adventures offers guided horseback riding tours.. on the beach!!!! Â This two hour ride takes you through the maritime forest then down to the beach, you can walk or canter along the ocean during this unique ride. *Travel Tip- bring your cell phone to use as a camera, no logging large cameras and easy to snap a pic! Pack up the kids in the car and take a day trip to this cute little island. Â If the ferry ride alone isn’t adventure enough for you (think: sun on your face, wind in your hair, views from the middle of the Pamlico Sound, ad kids thinking its the coolest thing ever), then you’ll enjoy the history, ice cream parlors, and wine tasting Ocracoke has to offer once you arrive. This 55Â minute ferry ride makes it easy to leave in the morning and com back to Hatteras later that day. *Travel Tip- You do not need ferry reservations, but you’ll want to arrive at least 20 minutes ahead of time ad boarding the ferry is on a first come, first served basis. Real Watersports is one of the best kite boardingÂ destination spots in the nation! Kiters come from all over the united states to have fun here at this prime location on the beautiful sound. Â From beginner to intermediate, one of their 35 instructors will teach you everything you need to know to be comfortable on the water. This locally owned studio offers private or group session on the beach. Â The Hatteras Yoga instructors will alsoÂ come to your rental house so you can practice around the pool or in your home, and each class is tailored to your level. From experienced to newbie, yoga at the beach adds a great since of peace and tranquilityÂ to your vacation. This maritime museum is dedicated to “the preservation, advancement and presentation of the maritime history and shipwrecks of theÂ Outer Banks”. Â Over decades, there have been thousands of shipwrecks on our shores, visit the museum to find out why and discover an understanding of maritime OBX heritage. Whether its taking a charter boat our miles off the coast, or grabbing a pole and hitting the Avon Pier, you must add fishing to your to do listÂ while you’re here. Some of the best fishing on the east coast, you can catch tuna, dolphin, drum and more while visiting. To stay connected until you come, you can view their live pier cam at Hatteras MarinaÂ here anytime! 9. Cook with the fresh local seafood! A great way to make the most of your Outer Banks vacation while saving money is by eating in.Â If you have more than one family, or a group of friends, staying in your vacation home, take turns cooking one night with our fresh local seafood you caught while fishing, or get from a local fish house. With a permit, you can drive your off road vehicle onto any of the ramps on Hatteras Island and cruise to the point. 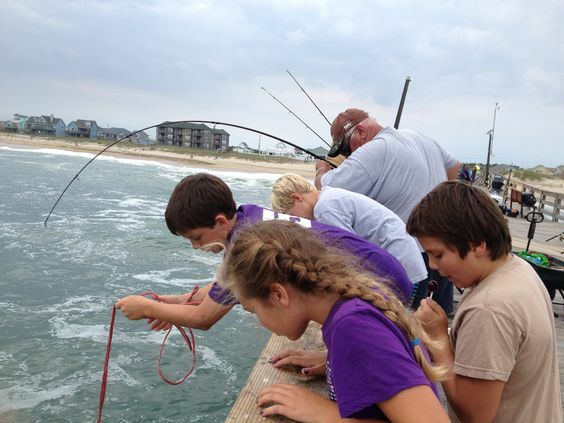 Cape Point, a destination for fishing and favorite family beach day location, is Hatteras Island’s easternmost beach. Â Save by getting at 7 day permit for only $50, instead of a year permit. We’d love to host you for your Hatteras Island vacation! Â You can browse throughÂ all of our Hatteras homes here.